We have mentioned Peckham Rye before but to be honest, we don’t mention then enough. Plenty of options for classic silk scarves these days, but these are as good as anyone. 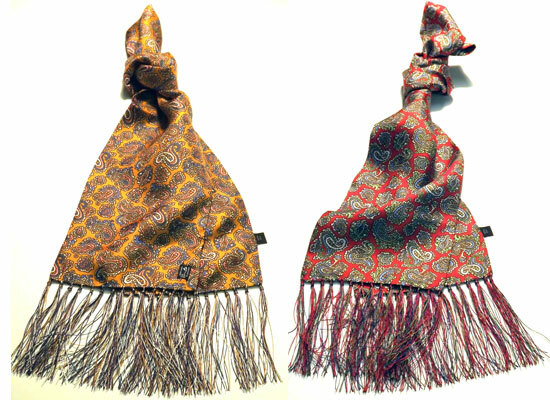 The Peckham Rye Victorian paisley silk scarves are just one style. This is very much in the ‘classic’ mould, a vintage-style paisley in a variety of colours, all constructed of the finest graded spun and nett pure silk twill, finished with a unique hand knotted Victorian styled ornamental silk fringes. The scarves are sized at 157cm long x 15cm wide (including fringes) and are sold with a diagram showing you various ways of tying. Not cheap at £62.50, but a worthy investment.